Who is “Rec”? 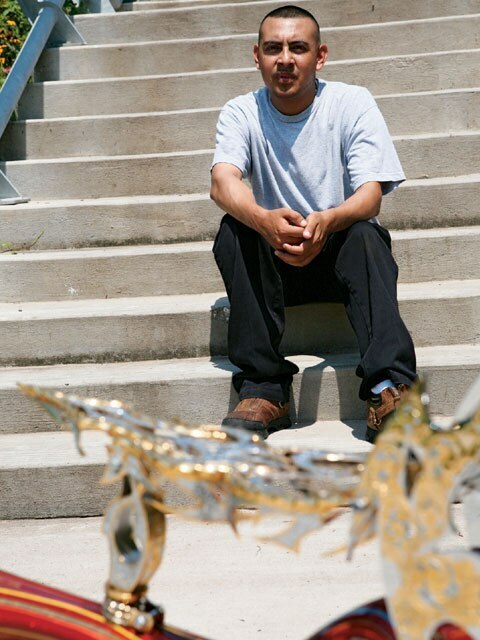 Jose Hernandez AKA Rec has been well recognized for his artistic talent in past issues of Lowrider Arte Magazine. 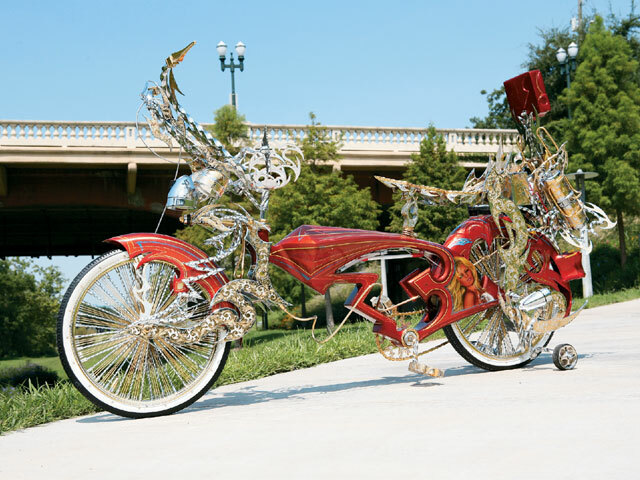 So when this artist out of Baytown, Texas, decided to build a lowrider bicycle, he didn’t just want a regular bike, he wanted to have the best of the best in his team. A few calls were made and what was planned as a down and dirty one-month project ended up being a two-year bike build. The bike was dismantled and different parts were shipped to different parts of the nation and some were even sent to Canada. 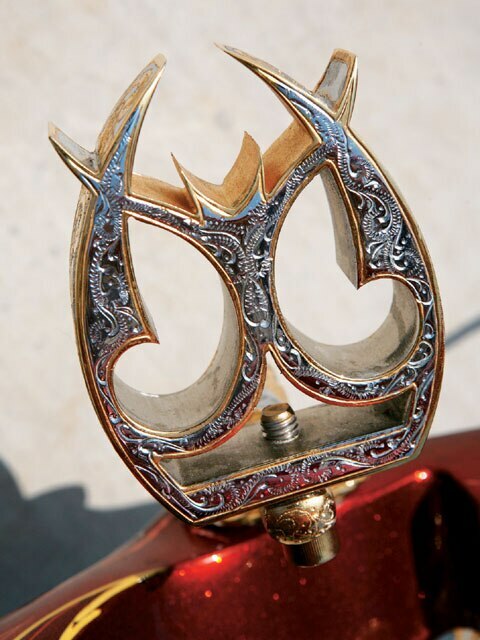 Lil’ Deville in Cleveland, Ohio, took on the extensive task of building a one-of-a-kind set of rims, and he came up with a twisted metal and three-spoke design. 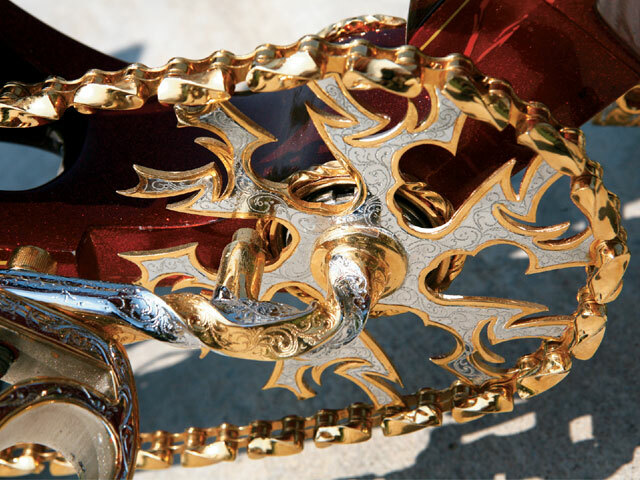 The spokes were gold-plated while the twisted spokes were chromed out. The rims also got a little extra TLC and were adorned with a long twisted metal spoke all around the outer lip. Meanwhile, the frame was getting some real Texas love. 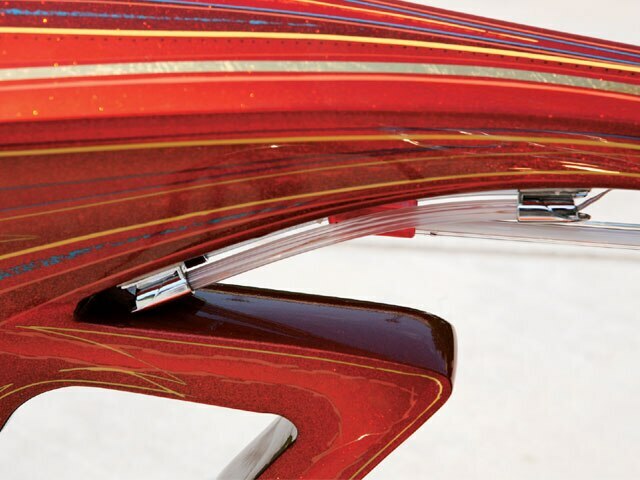 “Kandy Man” of Corpus Christi, Texas, took on the task of painting the bike with one of his unique paint jobs, using candy tangerine, flake, graphics and a bunch of pinstriping. The bike was then sent out to the one and only John Saenz, also of Corpus Christi, who applied a few life-like murals of women posing sexily on the rear panels. While this was going on, Canadian metal fabricator “D-Twist” supplied a custom set of cups. As different parts of the bike were finished and returned, Rec started to sketch out parts that he wanted to have custom made. 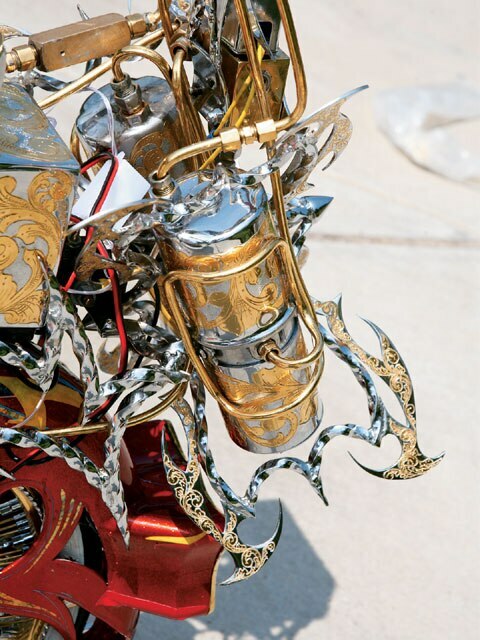 The sketches were taken to Manny’s Bike Shop in Compton, California, where parts like the sissy bar, handlebars, custom twisted chain, mirrors, lights, hydro setup and bracket, and seat became realities. 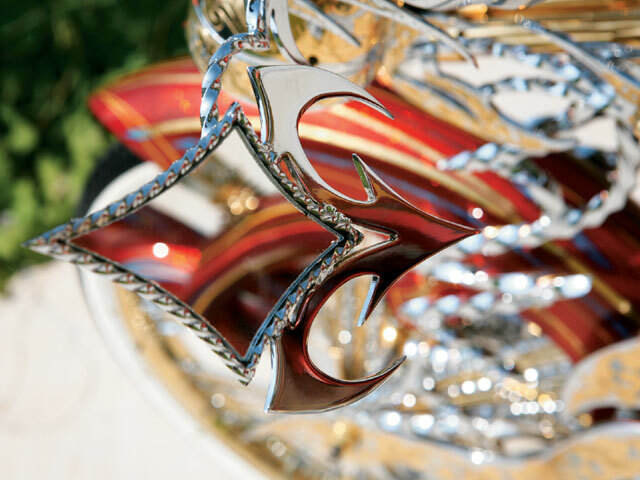 These pieces really turn heads when the bike’s on display. Mike at Toy Shop Customs fabricated a three-dimensional seat post, pedals and sprocket to give the bike a unique look and extra added points for creativity. 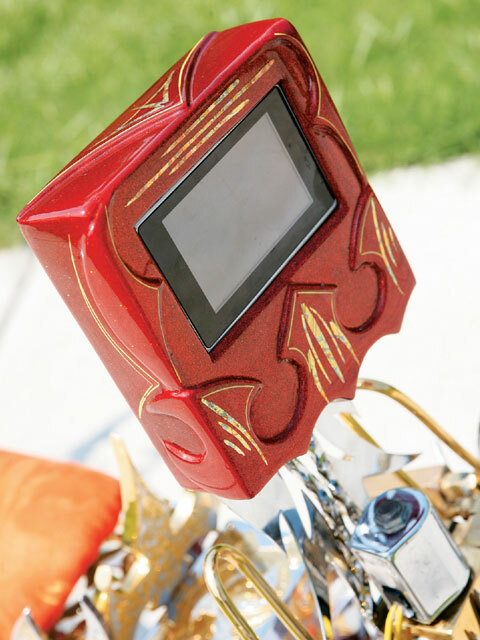 After all of the metal fabrication was complete, the parts were delivered to Carlos at Salas Engraving in Pasadena, California, who engraved them to the best of his ability. The parts were then sent out to “Speedy” to get everything covered in California show-quality plating. After a few years, the bike was complete and put back together. It was now time for a nice custom-made display. Ordayas Upholstery combined mirrors and neon lights to match the bike’s custom seat. The display is like the icing on the cake, and this well-presented bike has taken multiple awards around the nation. Look for Rec’s “Problemas” bike at your next Lowrider Tour event. Rec would like to thank all of the people who helped him out, especially his family, plus B.C., Emilio AKA “Drop’em,” “Mr. 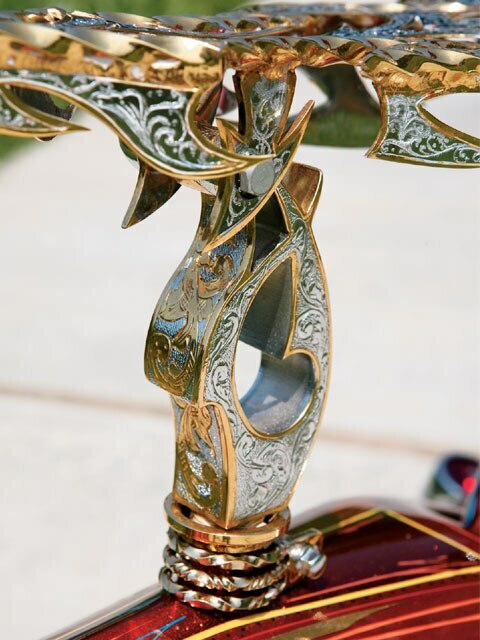 3-D,” Manny’s Bike Shop, Carlos at Salas Engraving, “Death Dealer” from Baytown, Latin Kustoms C.C., “Boss Cadillac” and everyone else who pitched in on the project. 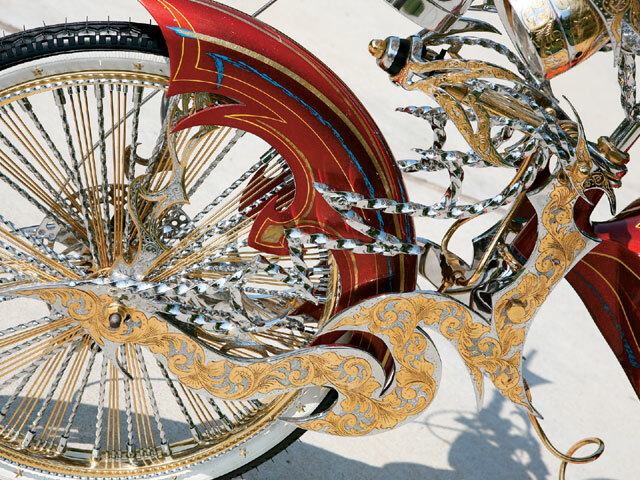 Now that you’ve seen Rec’s artistic lowrider bike, you might want to check out some of his drawings at www.3dart.7p.com.